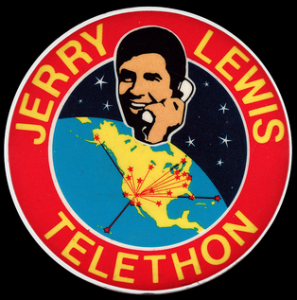 As a young girl I remember staying up late to watch the celebrities come out and perform on the Jerry Lewis MDA Labor Day Telethon (Lewis, 1973) on television. Every year Mr. Lewis took two days on a national television station, and all their affiliated stations, to air this telethon to earn money for a debilitating disease known as Muscular Dystrophy. I was fascinated with the idea of those big Hollywood stars of the time like Frank Sinatra, Dean Martin and John Wayne coming out to perform and answer phone calls just to collect money for “Jerry’s Kids.” I would watch as each star was introduced and led by Jerry to go and sit down at a table full of phones and wait by those phones for someone to call and pledge their money for the cause. I loved John Wayne and really thought I’d get to talk to him if I called in. I was young, only 11 at the time, and very impressionable. I didn’t know that I wouldn’t get to talk to John Wayne. I called in to the local number they had on the screen, and instead of Mr. Wayne, a volunteer operator took my call and my donation. I was a bit deflated, but it was for a good cause, so I was okay with it. Actor/Comedian Jerry Lewis was collecting donations around the country for the Muscular Dystrophy Association (MDA) and using the airwaves of television. He used his celebrity status to send his message across the nation for funding purposes (Lewis, J., 1973). ). As I have gotten older, I have come to realize that this was a version of crowdfunding. Television is not the only medium for such charitable organizations. Currently, people, namely fans, are giving their hard-earned dollars and, often, their time willingly to entertainment crowdfunding campaigns online on websites such as Kickstarter.com. From those early telethon days, we have come into the 21st century where crowdfunding for the film industry has been growing in popularity over the years and has been helped by the growing fan base for certain types of film, music, and television projects. While film and television are not the only industries seeking an audience with its fans, they are the most prominent. A good example of this is the 2004 television series, Veronica Mars (Thomas, 2004), which aired on the UPN/CW network from 2004 to 2007. In 2013 the cancelled series was going through a facelift and a new home on the big screen (imdb.com, 2014). The creator, Rob Thomas, wanted the network to help him turn the show into a movie, but the network didn’t think it had the viewership to become successful at the box office, so they passed. The fans wanted a movie, and at their urging, Thomas started a Kickstarter campaign to see if he could get the project off the ground. Because of the fans, the Kickstarter campaign was the most successful yet for the site. 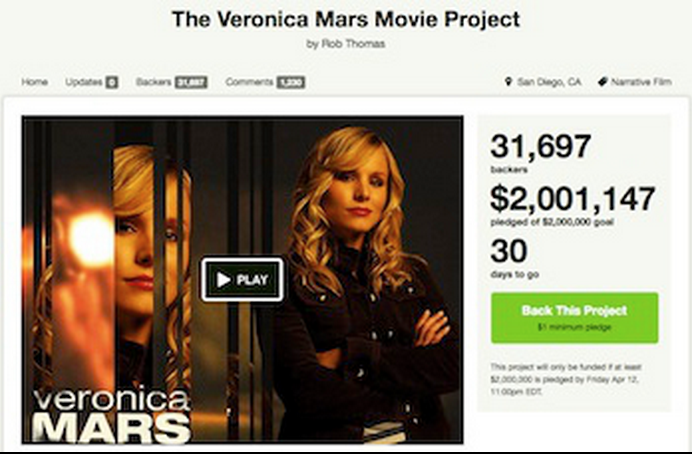 The campaign earned 2 million dollars (Thomas’ original goal) within the first 12 hours. The most interesting aspect of the campaign was the fact that it was completely funded by fans. The final tally for the movie campaign was 5.7 million, and it became the first big successful campaign for Kickstarter (McMillan, 2013). 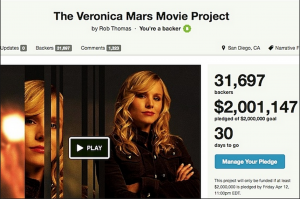 The fans for Veronica Mars were singular in their determination and surprised the network and Rob Thomas with their loyal following. Surely, the movie’s success was a fluke? With this case, I realized something important – were all the entertainment and fan-based campaigns that successful and if so…why? I have been trying for a while now to understand this kind of fan loyalty. I want to know why fans give. Many campaigns have come and gone since Veronica Mars. My research blog will focus on the entertainment-based crowdfunding campaigns, and how they possibly fool the fans into helping them promote their campaigns. I plan on sharing several case studies on fan labor, agency, and exploitation, including more details on the Veronica Mars movie. I will also show how the hierarchy of fandom and the devotion of those fans plays a part in why fans give of their time and money and how crowdfunding has created a new and more tangible way in which fans can contribute. Lewis, J. (Producer), & Lewis, J. (Director). (1973, September 2). The Jerry Lewis MDA Telethon (Television Broadcast) Las Vegas, NV. American Broadcasting Company.